- This creative pot can be used to many places. Home, office, festival exhibition decor are all the best choice to display. - Designed for displaying live plants, but can also be used to hold and organize a variety of other items. 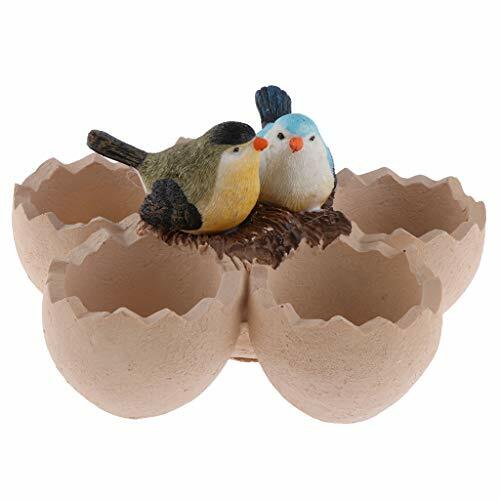 - Five eggshells can be packed into your favorite succulents, saving space and having a very cute look. - The material is resin,very cute design as pictures shown. - Perfect for small succulent. This creative pot can be used to many places. Home, office, festival exhibition decor are all the best choice to display. Designed for displaying live plants, but can also be used to hold and organize a variety of other items. Five eggshells can be packed into your favorite succulents, saving space and having a very cute look. The material is resin,very cute design as pictures shown.